Residents of the islands of Sumatra and Java were surprised by an unexpected tsunami yesterday. At the time we write this, there are reports of over 200 unfortunate deaths. Cause: Earthquake, Landslide, or Volcanic Eruption? Satellite imagery comparison based on Copernicus Sentinel-1 satellite imagery. Tsunami can be triggered by 4 processes: earthquakes, landslides, weather causes (storms), and volcanic eruptions. Tide gages in the Sunda Strait recorded the tsunami and there is a wide range of observations that can be found on social media. Tsunami caused by submarine landslides can be nearly impossible to plan for and there is typically very little advance notice. The Sunda Strait is the seaway that is formed between the islands of Java and Sumatra, Indonesia. This area of the world is best known for the 1883 eruption of Krakatau (or Krakatoa). This is a region of active tectonics and the deadly earthquake and tsunami from 2004 is still in our minds and hearts, not to mention the tsunami in Palu, Sulawesi, Indonesia just a short time ago. After the tsunami hit, people immediately thought about the Anak Krakatau volcano as a possible source, where there has been ongoing eruptions for several years. This volcano is located where the 1883 eruption happened and is part of the same volcanic system. There are ongoing efforts to monitor this volcanic system (Hoffmann-Rothe, et al., 2006). The vitally important service from national organizations like the European Union provide near real time satellite imagery. When compared with historic imagery, we have the ability to evaluate changes at the Earth’s surface. The landslide could have itself been triggered by earthquakes or an eruption. Considering the low level of seismicity, the eruption is the likely culprit. Because the eruption is continuing, the possibility for additional landslides and tsunami should be considered for people who live along the coastline in the Sunda Strait. We have outlined the general location of the shoreline on these images to take a first glance at the size of the landslide. The images are imperfect and this analysis is an approximation. The source of the satellite imagery is listed in the references below. We have also outlined the spatial extent of the shoreline of Krakatau prior to the 1883 eruption. The eruption in 1883 is known around the world because it had a global impact upon the climate for several years. Simon Winchester wrote a book entitled Krakatoa: The Day the World Exploded, August 27, 1883 and this is considered an excellent text that helps people learn about the eruption and the impact of volcanic hazards. The 1883 eruption also caused a tsunami that caused devastation along the coastline and killed several thousand people. 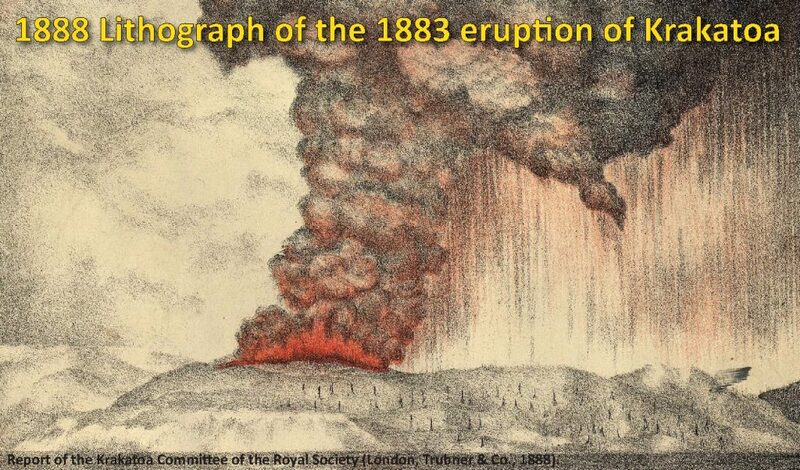 Below is a lithograph showing the 1883 eruption. This was published in 1888 (Royal Society, 1888). 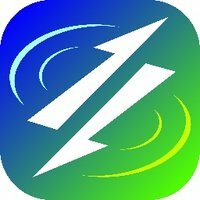 The Smithsonian Institution has an excellent website that covers the monitoring of volcanoes around the globe. Here is the webpage for the Anak Krakatau volcano. There are lots of videos and photos of the ongoing eruptions. Below is a spectacular video taken from an airplane sent by the Indonesian Government to investigate the situation. These natural hazards span the globe. 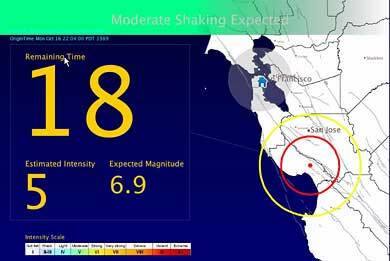 Learn more about your exposure to natural hazards at temblor.net. The tsunami lasted about an hour in places and created both sea level rise and fall. 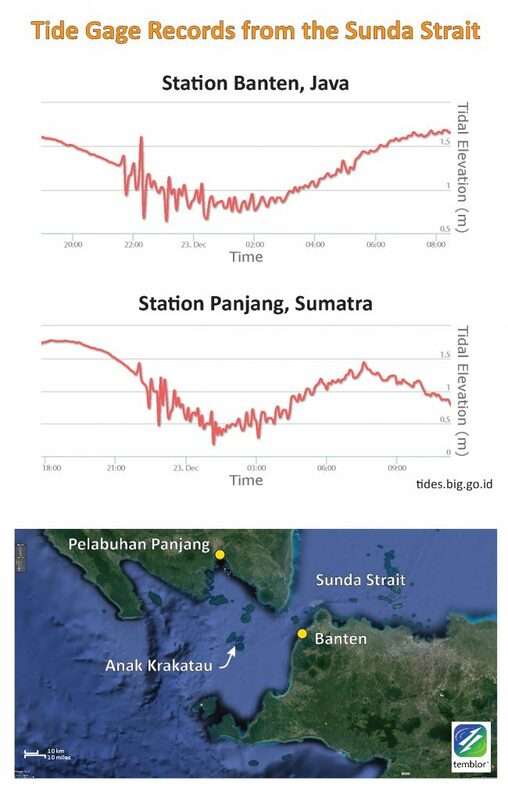 Below are two tide gage records from the region nearest the volcanic islands in the Sunda Strait. The upper panels show the tsunami records. The lower panel is a map showing the locations relative to Anak Krakatau. Tide gage records from http://tides.big.go.id . Vertical scale is in meters (about the same size as a yard). The tide gage record reveals that there was about 40 minutes from the first wave arrival to the highest and most destructive inundation. So, even without an expensive tsunami warning buoy system, or without a Krakatau Island seismic and GPS monitoring network, we can see, in retrospect, that warning was possible. A rate-of-change detector on tide gages could have been effective if a signal were sent to cell phones. Out of the 2004 ‘Boxing Day’ M=9.2 earthquake tsunami catastrophe was born the DART buoy system in the Pacific and Indian Oceans. Out of the 2011 M=9.0 Tohoku earthquake tsunami disaster was born much faster and more accurate tsunami warnings when triggered by large offshore quakes. Wouldn’t it be great if, out of this tragedy, a simple but effective warning system arose that could be ‘bolted on’ to existing telemetered tide gages that are already in place along the Pacific Ring of Fire and other volcanic centers? Royal Society, 1888. The Eruption of Krakatoa and Subsequent Phenomena, Report of the Krakatoa Committee of the Geological Society, London, Trubner and Co.